Robotic Process Automation (RPA) is generating a lot of buzz these days. Many predict this to be the next growth area in the IT industry which certainly seems to be the case. Just look at the automation bots around us today that are in daily use – Siri, Google Home, Cortana, Alexa, Handsfree systems in cars including auto-pilot systems, etc. I call these commodity bots or personal auto-bots (not to confuse with the Transformer kind though). While RPAs have a wow factor on the personal front, they have a much bigger role and scope of impact in the enterprise arena in the form of providing a digital workforce for automating the mundane everyday tasks. Process automation has been in play for quite some time with the Business Process Modeling Notation (BPMN) being an industry standard method for illustrating, designing and defining business processes in the form of a flowchart represented in XML format. There are workflow engines that are adept at reading the BPMN document and performing tasks as configured in the document. These tasks can be either manual or automated using some kind of system executable script. ArkCase itself uses a BPMN 2.0 compliant workflow engine along with a rules engine to automate business processes centered around case management, content management and task management to name a few. So, where would we use RPA? Is RPA meant to replace BPMN? The more I think about this, the more it becomes clear that RPA is meant to augment BPMN. ArkCase benefits from integrating with Robotic Process Automation platform in a number of scenarios. 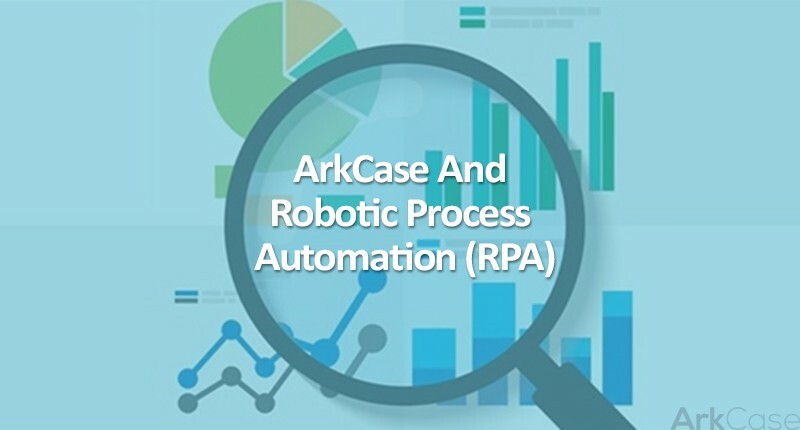 ArkCase manages end-to-end business process automation while RPA manages repeatable human task automation within the context of the business process. You have a million documents to evaluate and sort them based on the content – if the document contains PII data, flag them as sensitive and move them into a ‘sensitive’ bin with a redacted copy in ‘redacted’ bin. Move all other documents in ‘general’ bin. This is a simple workflow and all one has to do now is read a million documents and follow the steps outlined. But the idea of reading a million document and identifying PII in each is quite daunting. This is where RPA comes to the rescue. RPA platforms provide a digital workforce (process bots) that can perform the mundane task of churning through a million documents and segregating them based on the presence of PII. RPA platforms allow organizations to create multiple process bots which can be viewed as a virtual worker that is assigned the task of reading documents from the source folder. Let’s say that it takes a bot 5 seconds to read a document, identify PII, copy the document to a sensitive folder, redact the PII and move it to the redacted folder. If the organization creates 10 such bots, it will take them 8,333.3 minutes or approximately 139 hours to churn through the entire corpus. With 100 bots, the same task will be done in 833.3 minutes or 13.9 hours. The remaining tasks of generating the reports and setting up reviews for publishing is still handled by the BPMN compliant workflow engine in ArkCase. ArkCase can assign the tasks of reading documents and segregating them based on PII to the digital bots thereby expediting the processing. One can argue that this can be done without bots using multi-processing or parallel processing tasks within ArkCase and they would be absolutely correct. But this would mean that we will be creating these parallel workers in ArkCase. Also, if there are multiple such workflows each dealing with different aspects of the business but all having some kind of mundane repeatable task as outlined in the scenario above, the multi-tasking aspect will have to be built for each workflow. The burden of parallel task management would fall entirely on ArkCase. RPA’s digital workforce take away that complexity thereby keeping ArkCase workflows simple and focused on the end-to-end process automation aspect irrespective of the number of workers running the individual process tasks. Also, some RPA platforms separate the processing aspect from the digital workers making the worker capable of doing different tasks at different times. In the above scenario, once the digital workforce of 100 bots churn through the million documents in 13.9 hours, they are free to handle a different task for a different workflow fed to them through ArkCase. This task can be as different as churning through a separate digital content library and segregating images, audio and video files, and auto-transcribing audio and video data. Other areas where we are exploring the benefit of ArkCase integration with RPA is in the area of FOIA request processing and audit processing with non-conformity tracking. For more information on how automation can benefit your organization, contact us.